Here at Tucker’s Collision Center, we know how frustrating motor vehicle accidents can be. We’ve all been there ourselves. That’s why our Service Team works hard to make your vehicle repairs convenient and pain-free. Our expert technicians offer a range of services to get your car back to factory specifications and to get you back on the road as soon as possible. Now, when it comes to auto repairs, it’s important to understand that different services are optimal for different scenarios, depending on the nature of the accident and the extent of the damage to your vehicle. You may have heard about paintless dent removal as an alternative to full-on body work. It’s true that it takes less time, but is it right for your situation? Is Paintless Dent Removal a Viable Choice? 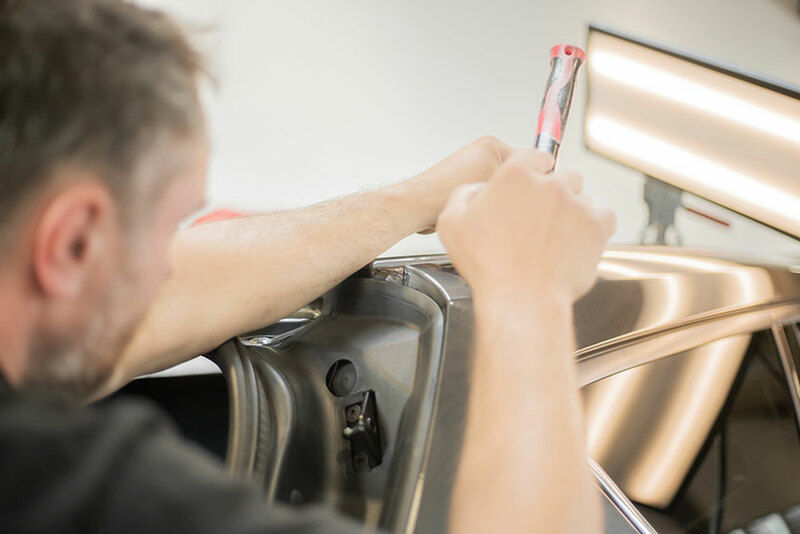 Paintless Dent Removal, also known as PDR, is generally a more affordable and speedy form of dent repair – one that doesn’t affect the paint job on your vehicle. It’s a less intrusive form of repair, but it is only really effective for small to medium repair needs. Think shopping carts at the grocery store, small fender benders, a baseball to the roof, etc. PDR is a good option in many instances. But it’s not always possible when it comes to larger, more serious dents. If you’ve been in a bigger accident with more severe damage to your vehicle, PDR may not be for you. When your car, truck, or SUV has damage not only to the paneling but to the paint job as well, it becomes necessary to repair dents and then color match and repaint the vehicle. New panels may have to be ordered if the dent is large enough, scraped, or gouged. Tucker’s Collision Center technicians are equipped to service your vehicle regardless of the severity of damage. If more serious repairs are required, we will determine the best approach towards getting you back on the road. We will thoroughly inspect the damage to your vehicle to determine whether or not paintless dent removal suits your needs. Tucker’s Collision Center uses the latest technology and specialized tools for PDR, ensuring your vehicle is restored back to its pre-accident condition. Whether you have a minor ding or a major dent, bring your vehicle to Tucker’s today!